First, to test-compare toe wing pressure and spring rate I rigged a nice setup that simply pulls the backcountry skiing binding wings open to the side. Clever me, I thought, until it became apparent that my nifty little fixture didn’t work for Dynafit bindings with power towers*. So I went back to using a boot sole with a chamfered out tech fitting that exited smoothly from all tested bindings in a simulated side release. (Without chamfering, the boot fitting caught on some of the binding toe pins and spiked the reading in a way that didn’t allow evaluation of spring tension. This “catching” problem is an ongoing concern with tech bindings in general, but not something this test is designed to accommodate). UPDATE: Solution for this was to build another system that eliminated the boot. See this post. I had concerns about wear of the tech fitting changing my results. Turned out this was not a problem as I did so few samples. A few repeated tests verified this. In a test with more bindings care would need to be taken, as fitting wear would indeed mess up the results. Original plan was to develop a chart with actual numbers, but the results varied a bit between individual bindings of the same model, around 15% in one case. Thus, without increased accuracy and a larger sample size for averaging I felt it irresponsible to try and do an exact listing of numbers and subsequent comparison. Suffice it to say that the weakest springs we tested were in a quite old pair of tech bindings, measuring 6.1 kg with our method. Marker Kingpin 13 and Dynafit Speed Radical were also represented and did ok. I don’t mind naming names for the strongest, since even while doing hand checks you can feel how stiff the G3 ION springs are in comparison to other bindings. ION measured 7.7 kg, a full 25% stronger than our least stiff tech binding toe! I know from my factory visit to G3 some years ago that they put a lot of design work into having beefy toe-spring tension. What is more, if you’re at all technical minded you can observe with the ION how “deep” the toe wing hinge (under the boot toe) folds down. My theory: In reverse, the toe wing hinge has a longer distance to travel before it goes “over center” and freely releases your boot. The idea behind having strong springs in the tech binding toe is twofold. First, the added stiffness could make the binding more resistant to accidental release caused by the toe wings opening due to vibration or side force at the toe. Second, the stronger the springs the easier you can tour with the toe unlocked. Experience bears this out, as our strongest measured binding (ION) is the only one of our samples we can consistently tour with unlocked, in a practical sense. *Note: In my opinion Dynafit Power Towers can help prevent pre-release due to tech toe opening to the side, but only if the boot toe shape causes the boot plastic to be quite close to the towers. You can test this on the bench. Where this rig will come in handy is in testing manufacturer claims of stronger toe springs in various models (e.g., Kingpin 10 & 13). I’ll keep it activated and use as more binding samples come in. Oh, and since you’re going to ask, the way this is set up has no functionality to compare release tension of classic tech toes vs bindings such as Fritschi Diamir Vipec and Trab TR1. The geometry is too different for comparison. Another view of the rig. Drill turns a simple windlass that pulls the test. I found that with a light touch on the drill I could pull at a gentle constant pressure that gave consistent readings. The drill is off the side of the table so it can be turned by hand for experiments needing tiny amounts of movement. Winch is simple and effective, cord is kevlar. Beyond and possibly more important than “safety” release, ski binding retention is the gorilla in the room. It doesn’t matter how good your bindings provide safety release, if you fly out of your grabbers unexpectedly. The springs in a classic tech binding toe are in a sense “decoupled” from the lateral release, meaning that as you adjust lateral release (usually by twisting a screw in the heel unit), the tension (technically, the “spring rate”) of the toe springs stays the same. What this means in a practical sense is that the larger aggressive skier gets the same toe springs as the 12-year-old. The youngster will have no problems with pre-release. In other words, if the perfect additional force is applied to a tech binding while it’s in the process of rebounding due to vibration or ski chatter, the binding toe could open more easily than you would expect. In my opinion this applies to all tech binding that use toe springs and wings with an over center pivot configuration (the “classic” tech binding toe design). While an incredibly sophisticated “tech” binding could perhaps be built that damps shock instead of having springs that simply “rebound,” I don’t see that on the horizon (bear in mind that “rebound” is what causes the return-to-center action of most bindings, so it’s not all evil). Instead, the simple solution seems to be having fairly strong springs in the toe unit, with perhaps a slight tweak to the geometry of the toe wings. Again, as far as I can tell ION is the best example of this. Other current products such as Marker Kingpin and Dynafit Radical also have strong springs that appear to perform well. Unfortunately, the only real test for how well a tech binding does with retention is to ski it at “normal” release values, unlocked, and see if you experience flight sans ski. In my experience, very few skiers set their tech bindings at chart value. Even if they do, it is rare to have the binding tested on a machine to be sure it’s actually delivering values as assumed. Thus, stories about how “great these bindings are, I never come out” should be suspect until the DIN/ISO 13992 norm is revised for better testing of shock absorption and retention, bindings are tested by an independent lab to match or exceed the new standard, and skiers have their bindings tested individually for release values and use them consistently at “normal” settings, unlocked. Our pull tester rigged to simply check binding toe opening force by pulling a binding wing. I’m not 100% convinced this works correctly. The dynamometer does measure a peak load and the 2×1 pulley system doesn’t overload the instrument. I’ll add more info here as I refine the process. It might be more appropriate to state in the title that the Ion has “stiffer retention” rather than “is strong”. “Strong” carries some socially-implied meaning of tensile strength and robustness, neither of which are checked with your test rig. When I saw the title, I was pretty sure you’d broken out your ACME crowbar again. Super glad to see you describing and using your test rigs. Simple quantitative discussions of tech release characteristics are a healthy thing. Did you pull a Vipec, too? There’s a lot more to toe elasticity and release characteristics than peak force. I’m still a TLT codger, but the Vipec’s sliding toe plate is the only major toe innovation to directly take on the lack of tech-toe elasticity. I do. The only issue I’ve had with prerelease is with the ski fully dorsiflexed in a mogul. Much less of an issue with the power towers (it’s only happened once since I got the radicals three years ago), but used to happen pretty regularly in my old FTs. BTW, Rick and I now have a full 2D release envelope for the Vipec. As suspected, the graph looks more alpine than tech, with a few anomalies. How about testing some release forces with the toe levers one click up Lou? This could be your best work to date, Lou !! Also, I’d like to nominate the Onyx for testing. Afox, I did expect a bigger variation, based on PR spreech. Thing to remember is that (IMHO) toe springs can have too high a rate and cause undue wear as well as effects such as closing on the plastic of the boot and wallowing it out. The ION seems to be a good compromise, though don’t close it on a finger! Plan is to do more testing as I get more gear. As mentioned, I also rigged up a way to simply pull the binding wing to the side (using a 2×1 pulley and cable). While I can’t do an overall comparo this way due to the Dynafit power towers, I can do a comparo within a brand so I’ll do so if I get the gear to test. Regarding Vipec, I’m pretty sure my method would not work to compare it to the other bindings, but I’ll give it a try and see how it looks. Lorne, not all tech bindings have “clicks,” and if they do they’re only there to take up manufacturing slack, not as a way of calibrating or setting release values. If used as a release value booster “One click up” on one binding could do nothing, while on the other one could increase RV drastically. The best way to boost your RV is to go to a shop where they can test it, figure out a number you want, and set/test both bindings until you achieve equal results at the desired number. Doing anything else is like shooting a .357 in the dark at a granite boulder from two yards — without eye protection. I’ll parrot Lorne’s request. It would also be cool to see numbers on auto-locking lowtech toe pieces (ie Plum 145/165). Sceond, though it seems to be contained within this (awesome) blog post, would you define “pre-release” for us? My (totally unscientific) feeling is that, while pre-release may be a real thing where a binding releases under forces less than the expected value, in actual use it becomes a subjective term based entirely on the user. “Oh man I totally pre-released back there while I was backseat-straightlining through that mogul field.” Riiiiight. Versus super talented skiers who keep their DINs low, ski hard and fast, and never complain of a pre-release. See, yes, sometimes you’ll get a boot socket and binding combo that “catches” in lateral release and spikes to a high release level. If you work with much of this gear you’ll encounter it. That’s what happened when Scott first took over Garmont, which they fixed admirably and ended up making some of the smoothest releasing and nicest boot toe sockets I’ve seen. Sometimes it seems to be a combination of wear on the bindings and/or the boot toe sockets. This is one area where as the industry matures and more shops use a binding release check procedure, we could see some issues but also major progress. For the testing I published above it was only important that the boot released smoothly without catching, so I slightly modified the boot toe fitting so it does so with all the test bindings. Very interesting setup and results! Thank you for that. Would this test-setup (with modifications of course) maybe also allow to test for necessary way of travel/rotation before release? Or seeing it the other way around for elastic travel? Purely out of curiosity, I wonder how that most maligned of bindings, the G3 Onyx, would fare in this test, given that the toe unit operates in the opposite way to the classic tech system? If it is comparable to the ION, then congrats to G3 for retaining the positives and ditching the negatives of the Onyx design. Knut, no, setting up to measure travel would be difficult. It might actually involve taking two measurements concurrently, force and distance. Yet, remember that ANY tech binding that uses the classic ball/socket interface at the toe has virtually the same amount of potential travel before the boot comes out of the binding. This is an inconvenient truth, and the reason why companies such as Fritschi are doing what they are doing, and Dynafit is doing the rotating toe units. The burning question with the Dynafit rotating toe is if it really adds more travel, or is just a way to obviate and catching or stickiness in the release ball/socket. Remember that the classic heel pins also have a limit to how much the binding can rotate before the boot comes out laterally, so you can build all the lateral elasticity you want into the toe, then you’re looking at the heel as the limiting factor (hence, Kingpin? And on and on! I think it was Hoji I overheard wondering if you paired a Kingpin Heel with a Beast 14 Toe???? I remember the Cosmos socket issue well. It was almost as exciting as Kingpin-gate. What I found troubling about the fact that you needed to chamfer the sockets on the test boot was that I’m guessing those are genuine Dynafit sockets and therefore as “standard” as they come. Assuming the bindings you tested were mainstream/not exotic models (Ion, Radical, Kingpin, Vertical, and so on), this suggests even less compatibility than I had previously expected. And if the catching can be caused by wear of boots and/or pins, then a boot/binding combination that worked properly at one time can gradually become dysfunctional over time in a way I’m not sure many people check for. See, they are pretty old boots, quite worn, and so was one of the test bindings… I think what I did just eased off the socket so it’ll work with nearly anything. It worked fine with the less worn bindings. Whatever the case, it’s such an old boot fitting it has no bearing on how the new ones are made. Not fitting-gate this time, anyway (grin). Even so, bad fittings or bad fitting/binding combos are very real, but fortunately easy to test for with with a simple hand check. Also, this means nothing for people who lock their bindings when they ski. Oh, and I’d agree, worn bindings and boots can be a problem. Same with alpine bindings. Nothing new there, just that for some weird reason Dynafit binding users will without hesitation ski on 20-year-old bindings and boots. See it all the time in Europe. Perhaps because the stuff actually works pretty darned well? Alternatively, (and I really hope this is not the case), it seems possible that high toe spring tension could cause the camming action of pin and socket to be more critical— prone to catching given slight variations in the shape of the parts, contamination, etc.. Time and testing will tell, and the fact that it was the older binding that caught (if I read you correctly) suggest this is not a problem. This is even more reason for WildSnow to test and publicise values for various popular binding models, no? I’m awaiting to see how Vipecs do the job! I know that vipecs and others as Skitrab relys on different geometrics and mechanics, but the job to do is the same. You dont change the moves and the forces you make skiing just by the type of binding you wear…so let’s compare different systems! I’ll second Drew’s statement. Pre-release is not nearly as common as advertised in practice and the vast majority of “pre-releases” are yardsale crashes painted over as ego-gloss. I ski my dynafits at the recommended level, and can’t say I’ve ever come out of them with no just cause. Every “new” development of the last 5 years or so has been driven by the animus of TGR and thats the only reason I mention my experience at all. I don’t need or want 2 lb Ego-Bindings – and I DO ski harder than most. The cost and effort of getting DIN 16 bindings TUV certified does nothing for me – nor, frankly, for the majority of people buying them. 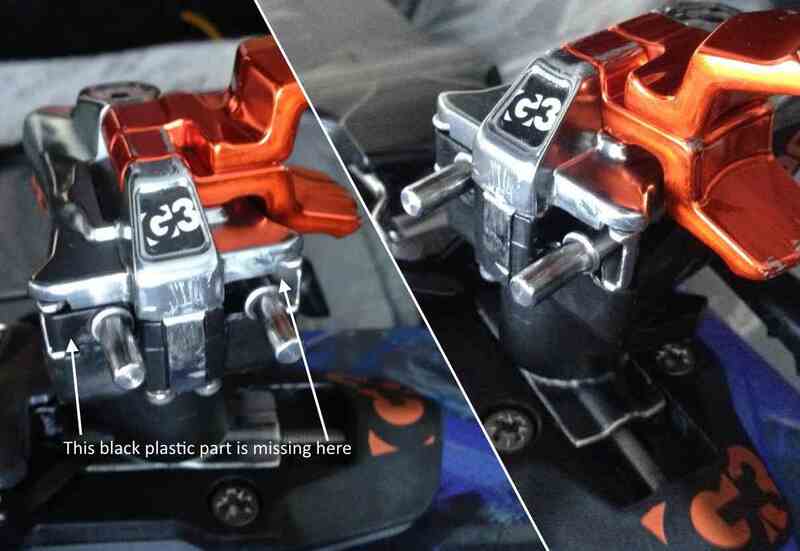 Some of these things are being addressed with forward pressure – the new heel from Marker, etc – but for the most part, only in DIN 5280 bindings at the top of the weight scale. Pre release happens on occasion with all ski bindings, for various reasons to one degree or another. But modern alpine bindings, properly adjusted and used correctly (snow cleaned out before entry, properly shaped boot sole etc.) have pretty much eliminated the problem. In my opinion the CLASSIC tech bindings do pretty well also, but not as well as high quality alpine bindings. The new crop of tech bindings might be even better, but it’s too early to tell. There was a time in the 1970s and on into the 1980s when pre-release was common and caused many injuries and even deaths, if I recall correctly. Bindings gradually got better, but it wasn’t night and day. Still is not. It’s an incredibly difficult engineering challenge to build a safety release binding that doesn’t ever pre-release when it’s set to actually release if needed. For anyone else wondering, “about double, maybe a little more” is my estimation for a Plum Guide toe’s lateral release with levers up one level (not into the “clicks”) vs unlocked. First and second “click” positions both seem to lock out lateral release completely. Similar guesses for other binding models, anyone? “tight” is a great replacement for “strong”. Nice choice! FWIW, I messed around with a rig that pulled on both sides of binding toe using a line that ran from one pin, through a turning block, under the ski, through another turning block, and back to the other binding pin, with weight hung from line directly under ski. Probably wouldn’t overload grip tester because it took a lot less than 200 lbs to open binding. I didn’t pursue it because it looked like it might be hard on the bindings, but with your windlass system you could stop pulling as soon as release occurs. See, that sounds like a cool setup (other than yanking on the binding over and over again) what kind of weight was it taking to pop open the binding? It’s taking around 80-90 pounds of “force” here on the ION, but my readings seem too high compared to that old G3 graph. In any case, yes, no matter where I go with this I’ll be using an instrument. I’ll probably get a pull tester eventually that’ll allow me to graph a curve on the computer. The grip dynamometer only shows one max force reading and being jerky with the applied force (drill) spikes the reading if I’m not careful. I Understand the variability of “one click” settings but would be curious to hear what happens if you run this test in full tour mode: very high force release, break the boot, break the binding, break the system? Use some old gear and try it, just for fun. I didn’t measure, but I’m guessing it was 45-70 pounds. Maybe some difference between force applied to one vs. both pins? Drew, what is 7tm Power Tour? Never mind, Lou. It was a tele binding. No one has used a tele binding for several hundred years, now. Maybe try the side pull test with a fixed line to the pin opposite the one attached to the instrument/windlass and allow the ski to “float?” I’m guessing the readings will be lower. I often used “one-click” as my ski mode with TLT Verticals. My Plum Races autolock, but I suspect the locked Plum is not as strong as a Dynafit TLT pulled to its full four clicks. Another interesting binding to throw in the tester would be the ATK Race Tour. That binding has some sort of toe tension release adjuster where a threaded piece changes the tension on the lock lever. That said, I don’t think ATK’s mechanism is the solution, as Lou’s numbers show the depth of the hinge with the Ion, among other things, may make a huge difference. I’d like to see a tech boot/binding where the fittings/pins are 2x size. With standard tech bindings the release is virtually static – you’re in or out. It seems like if the fittings were rounder and larger, a more dynamic release could be achieved with the same mechanism. Obviously the “lever click” method of lateral rv adjustment can be a shot in the dark, but a well designed, field adjustable toe piece is another story. Such a binding could be a viable alternative to the stiffer springs/sliding toe/turntable toe designs. I think Trab may be working on this? One click, four clicks, whatever – all of you people locking your toes (and I admit I’m one) are forgetting one thing – virtually all of the “unwanted” release incidents with first gen tech bindings are in the forward (upward) plane, not lateral. Locking the toe to any degree only increases the lateral release force. And Drew, I’ll be watching for those 7TM’s in Haines this week. Wanted: A proven product which is long term durable, light, easy to use with a no bending over step in function, no icing up issues and DIN release safety. It’s the 7TM Power Tour! Just requires a good tele skier who doesn’t need the beef of heavier tele bindings and likes narrower skis. Clearly there is no going back to the future for a binding that is no longer being developed. In the meantime we have to wait 2 or 3 years for all the potentially exciting new pin tech stuff to be sorted. Ideally this lag time will be removed by a whole series of cleverly designed machines which will catch the problems before things are released to normal folk. Great information Lou. One question that popped up for me: does using a sole with the top chopped off present an issue of sole flex/distortion when you test the binding release? I assume the boot is designed as an integral whole, with the cut-off part adding structural integrity to the sole when buckled as a whole around a skier’s foot/leg. If I were designing a boot sole dummy to test as you are, I’d make it solid and as rigid as possible because there’s no half-dome of bootness adding rigidity atop the sole. But if designing a whole boot, I can make the sole thinner & lighter since the half-dome adds structural support. Check the folks at Dalbello and what they realized by making the sole a solid block when going from Krypton to KR2 — greater lateral response & control. Do you think pintech binding makers should be pushing their products toward alpine durability, release value, elasticity? Should the people who buy pintech bindings for the image be the ones driving the R&D goals? Why slant bindings toward alpine downhill lift-served performance if the primary use is going uphill? Is every theoretical customer, including the image buyer, the only way to pursue R&D? The historical audience should be ignored, the historical uses ignored, just for a new market of people buying an image rather than a tool they’ll use as designed? I want to know walk mode test results. Ad, my understanding is in this kind of testing, so long as everything stretches, flexes and twists the same each time, the system is valid. The load on the boot sole is very low, due to the leverage of pulling on the heel. Also, remember I am not testing “safety” release values, this is just to compare strength (spring rate) of the toe jaw springs. It is true that the historical market is being ignored in some efforts to open up new markets. But the big historical ski touring market is still being served quite well, IMHO. I’m sure I’ve commented on half-locking bindings on Wildsnow before, but the effective RV can be wildly inconsistent. I’ve readily released from half-locked bindings in the past, and broken an ankle with a half-locked binding of the same model. Effective RV varies from unit to unit and perhaps between installations. If you’re going to half-lock, it’s essential that you verify that each binding does whatever you think it will. After breaking an ankle, I’ve happily avoided skiing consequential boilerplate and therefore avoided the need to lock toes to any degree. The real solution to the problem is a binding with greater elasticity. Those are just beginning to hit the market. adelbert, even if the “primary use (of pintech bindings) is going uphill,” some might say that the primary use of going uphill is going downhill. But marketing tech bindings to skiers who need alpine level performance for downhill skiing does seem a bit questionable until it has been proven that the new tech bindings can match alpine binding performance. And I hope the performance claims are true for the sake of the early adopters. What will be interesting is if we eventually see an epidemiologic study of tech binding users, rre leg injuries. Anecdotally, I can say I consistently hear reports of broken lower leg (tibia) that are probably tech binding users, while the last time I heard of a broken leg on alpine gear I can’t remember. I’m sure it happens, but it sure seems rare. But considering the number of tech binding users, if there was a big problem with safety I think we’d see a lot more crutches in use in areas where a lot of people ski tour. I’ve just not seen that. BTW, someone asked about upsizing the tech binding interface. I’ve advocated that to some degree, but if you make the boot socket toe interface any larger there is too much steel-on-steel friction and you have to lubricate it. That was a failing of the Ramer binding. My opinion is that tech 2.0 could remain the same at the toe but be made slightly wider and taller at the heel fitting. Since the heel has something like 4 mm of travel in a classic tech binding, just adding one more mm is significant 25% increase in travel! I like the idea of the rotating toe unit a la Beast, but only for freeride, it’s in my opinion not necessary for a ski touring binding. If the tibia fractures are the result of toe locking and the alternative is occasional “prerelease,” epidemiology might not easily identify prerelease injuries (which I expect can be all over the map). I think such epidemiological studies are really worth doing what with all the new binding designs coming on the market. Commercial considerations probably complicate matters, but if some of the resources devoted to standards and testing were devoted to such studies… well, here’s hoping. In my opinion, some of the tech binding data worth collecting are: injuries with bindings locked, injuries from prerelease, and injuries from forces at the “sour spot” of the ski— at the toe. Not easy, but worth a try. Lou, I’m younger, but never heard about tibia fractures at lower leg in Spain or even Europe related to skiing, alpine nor touring. I always Heard about LCA injuries when talking about skiing injuries. Can be significative epidemiological diferences in such kind of injuries between NA skiing style and European skiing style? There is nothing good about the 16 din beast toe, I’m a ski tech at a small shop that has placed 4 pair of the beast on snow this year and all 4 are waiting to be replaced since 2/5/2015, the movement that has developed in this product needs to be looked at. What have you heard of this problem? Chill, what problems have you noticed? I’m on the Beast 16, and the only problem encountered is the toe release “button” stiffening up, when trying to exit the binding during transitions. Some spray lube has since solved the problem. This also didn’t affect the actual release value, as I’ve came out of the ski every time I’ve needed to. Gdreej, 3 millimeter of vertical movement in the wing’s, I did see the ” button” problem thank you for that input. I just have 4 very unhappy customers. Dynafit has a few pair coming my way but I don’t know if the new toe has changed in any way other than the color. Guys in the trenches, I truly appreciate your chiming in here. Invaluable. I’d not seen that play in the Beast 16, but then we don’t have a high-use setup. I did notice that the turntable (toe rotate) of the Beast 14 does introduce a tiny bit of play. In my opinion a non issue, but be sure to check on the bench and make sure it’s acceptable. With this sort of thing it helps to have a baseline for comparison. I’d suggest grabbing a good quality alpine ski/binding/boot setup and clamping to the workbench. Stick the boot in the binding and proceed to wriggle and test for play. You might be surprised. The strong toe mount on the G3 Ion is also useful for skiing telemark style after a heel pin breaks halfway through a turn. FWIW, my ATK Free Raider 14 binding has incredibly strong toe spring force as well. Chill, any updates with your customers and Beast 16 toe wing warranty? Turns out that I have some toe wing play too, how did Dyna handle the warranty? Or is this even a warranty issue? Will the Vipec toe even release with you boot sole testing device or is this in the “blind spot” of the binding? I know this page is a few years old but I am wondering if you have performed this test on the new Salomon MTN’s? I am thinking of switching out my ION LT’s for the MTN’s but do not want to forgo toe wing strength. Thanks for all the info regardless!